ALG is a provider of residual value and other analyses to the automotive industry. Its Residual Value Awards honor the vehicles in each segment that are forecast to retain the highest percentage of manufacturer’s suggested retail price after three years. Honda was No. 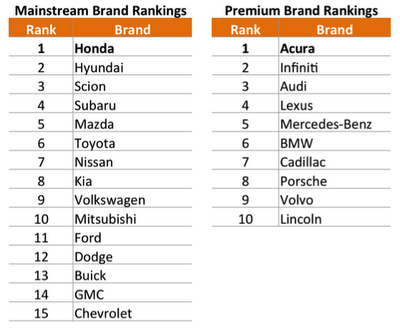 1 in the Mainstream brand rankings, followed by Hyundai and Scion. 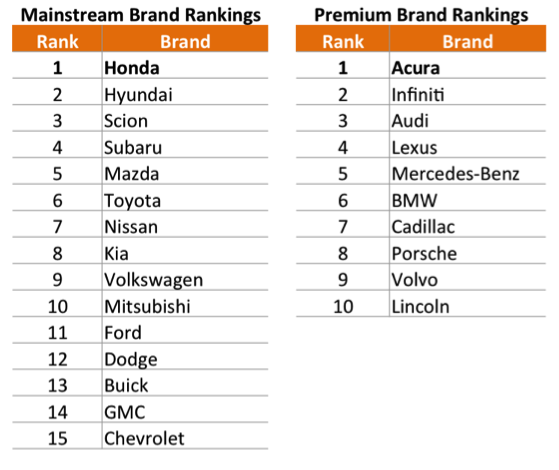 Acura topped all Premium brands, with Infiniti coming in second and Audi third. Lexus, last year’s highest-ranked Premium brand, dropped to fourth. Please refer to ALG's article for more details.